Where we grew up, peanuts boiled in their shells were a favorite snack. When we moved to New York, with its scads of Japanese restaurants, we learned to love edamame, or soybeans boiled in the pod. For cocktail parties, we turned them into this dip. Bring water and salt to a boil, add edamame and cook 3 minutes; drain but reserve water. Heat olive oil in a pan, add garlic, sauté 2 minutes, then add cumin and ground coriander and cook 1 minute more. 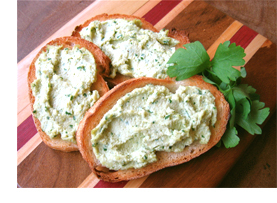 Variation: Edamame-Goat Cheese Dip During the purée stage add 5 ounces of goat cheese at room temperature. Then stir in the parsley as above. This version is great served warm.